To set the Comments subtitle for the Create Absence Request eForm, do the procedure in this topic. (Example) Set Columns for the Create Absence Request eForm. 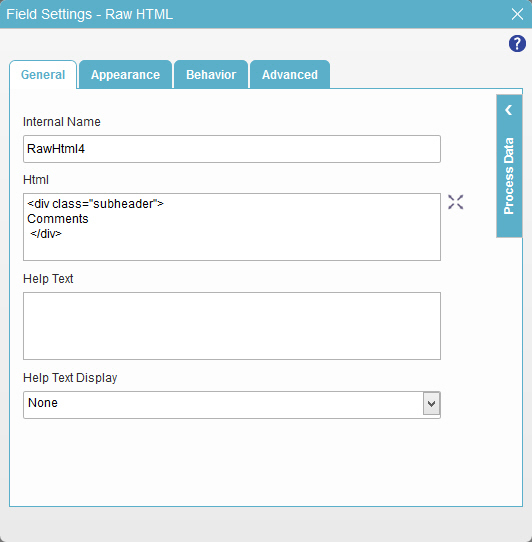 On the eForm Builder screen, in the Toolbox, open, the Advanced Controls tab. 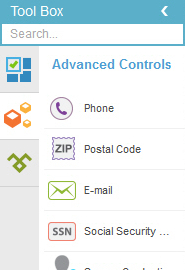 On the Advanced Controls tab, drag a Raw HTML form control onto your eForm. On the Field Setting - Raw HTML screen, click the General tab. To save the changes, click Close Screen . On the eForm screen, drag the right edge of the form control to the right until the width of the form control is 2 columns. On the eForm Builder screen, put your mouse on your form control. On the Form Control Quick Menu, click Adjust Width . Drag the form control adjust width bar to the right edge of the form control. The eForm Builder shows the Comments subtitle for the Create Absence Request eForm with 2 columns.